6月10日 arrived at the home of Nagayama with his companion Romaru 呂丸, Basho ate some rice gruel and slept. For Atsumi Onsen wooden dolls, see below. Leaving Mount Haguro on the following day, I came to the castle town called Tsuru-ga-oka, where I was received warmly by Nagayama Shigeyuki, a warrior, and composed a book of linked verse with him and Zushi Sakichi who had accompanied me all the way from Mount Haguro. 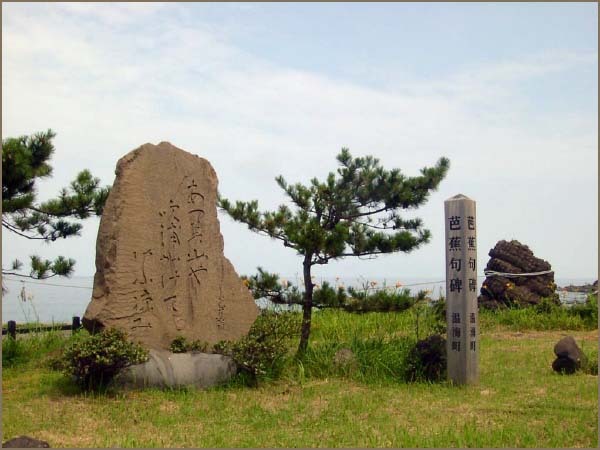 Bidding them farewell, I again descended the River Mogami in a boat and arrived at the port of Sakata, where I was entertained by the physician named En'an Fugyoku. Still in the hot sun. The flaming sun of summer. With its history of more than 1000 years, this old hot spring is located along Atsumi river. Hotels are staning along the river at the foot of Mount Atsumi which is about 2km ascended from the mouth of Atsumi river. The origin of discovery has several theories. Some says a child appeared in Kobo Daishi's dream and gave him a wise remark. The others say a woodman found a wounded crane bathing its leg into the spring water. 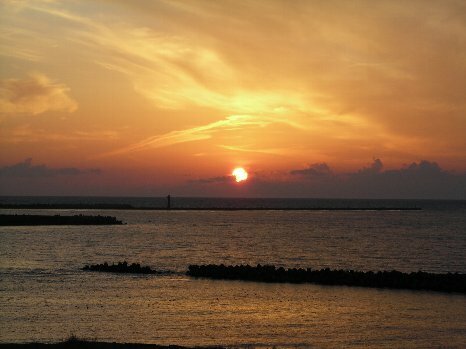 "Instead of the river pouring into the sea, the Mogami River pours the atsuki hi, which dan be read either as "hot sun" or "hot day", suggesting both a setting sun washed by the waves at sea and a hot summer's day coming to a dramatic close in the sea. 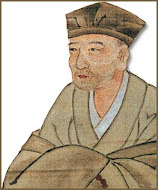 Basho drops the word "coolness" (suzushisa) and the constraints of the poetic greeting to a more dramatic image, one that suggests coolness without using the word."
. WKD : Eggplant なすび nasu, nasubi .
. hatsu makuwa yotsu no ya kiran wa ni kiran . His joy of slicing the first Makuwa melon of the season. Written in 元禄2年6月23日, in Sakata, Oku no Hosomichi. He stayed at the home of 近江屋三郎兵衛 / Abumiya Gyokushi 近江屋玉志, where they enjoyed the fruit in the cool evening. other items on the car are Daruma san, famous persons and animals. To make these kinds of small rings is a special skill of the local woodworkers. Now there are very few makers of them. 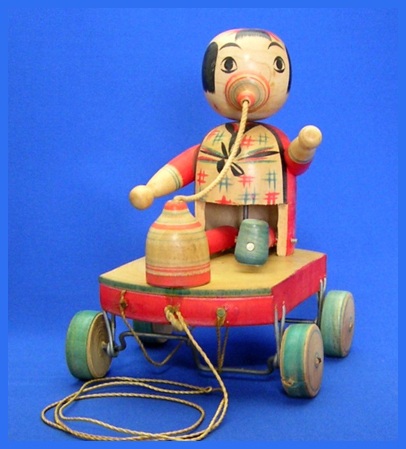 The human doll is ready to throw a ring on the stand before it. He is figured after a well-loved manga figure before the war, called nonki na toosan のんきな父さん a carefree father. 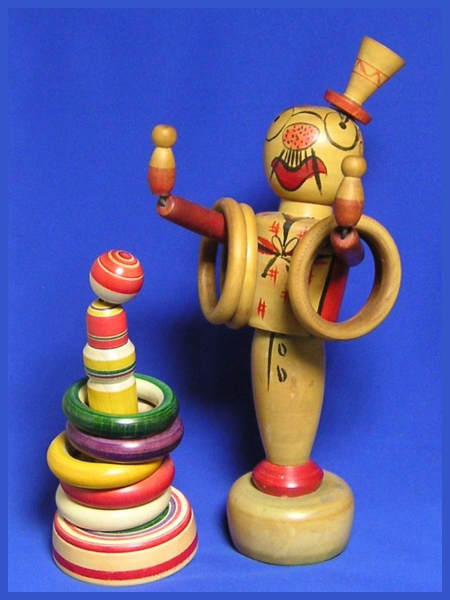 The figure is about 37 cm high.
. Tsurugaoka 鶴が岡 Tsuruoka mingei 鶴岡民芸 folk art from Tsuruoka .